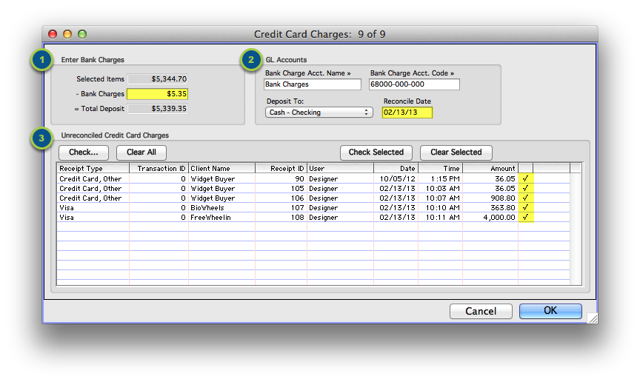 The Credit Card Charges window is used to review and report on Credit Card transactions processed through the Receipts screen. Any authorization activity performed through AcctVantage via Authorize.net will be recorded here. 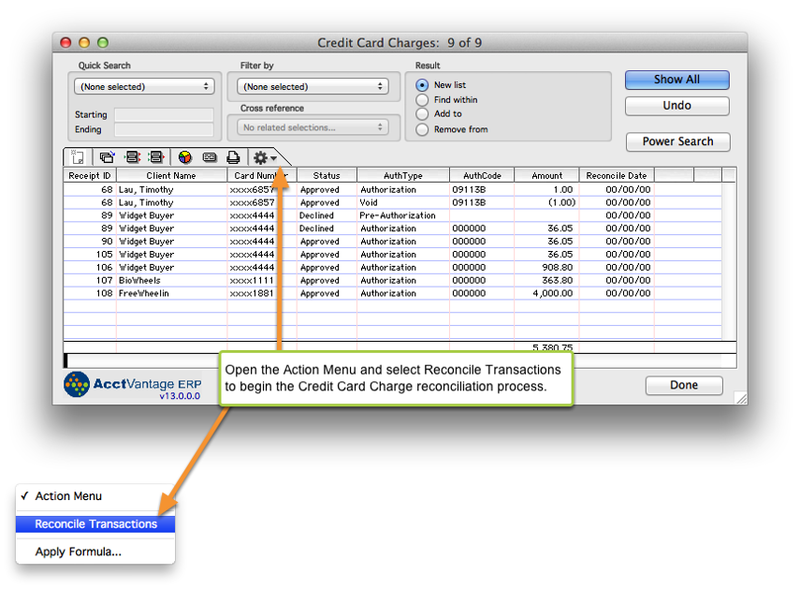 An Action Menu item is provided to allow for reconciling transactions. 1. Open the Credit Card Charges window. 2. View (and reconcile) the Credit Card Charges. This is a read only window. Credit Card Charges can not be entered here. They are entered either through the Receipts window or through the Payments tab on a Sales Order. View the summary or detail of a Credit Card Charge. Print a report on these items. Zoom: View (and reconcile) the Credit Card Charges. Selected Items: This is the total of the transactions that you have checked. Bank Charges: If the bank will charge you a fee to process the batch of credit card transactions you can enter the fee in the Bank Charges field. This fee will be deducted from the amount that is debited to your Cash GL Account (i.e. 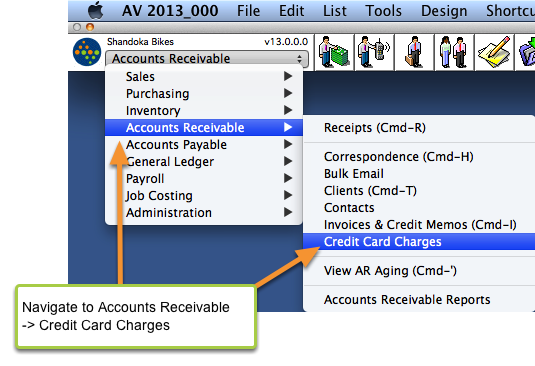 AV will debit the Bank Charge GL Account for that amount). Total Deposit: This is the amount that will be debited to the Deposit To Account (see next section). This will typically be your Cash GL Account. Bank Charges Account Name & Code: The GL Account that will be debited if you enter an Amount in the Bank Charges field (see previous section). 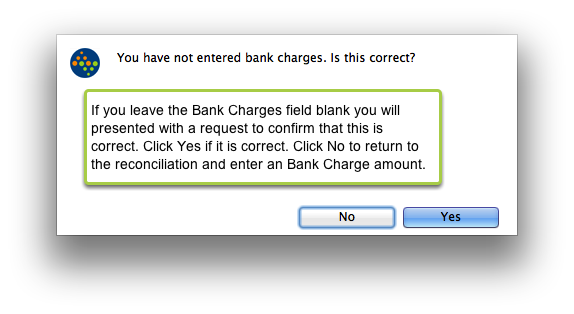 The Default Bank Charges Account to use is set in System Setup. You are free to change the account on a per reconciliation basis here but it will not change the Default Account if you choose to do so. Deposit To: The GL Account that the Total Deposit Amount will be debited to (see previous section). The Default Cash Account to use is set in System Setup. Reconcile Date: Enter the date you are reconciling these Credit Card transactions here. Check all listed transactions by clicking the Check... button. 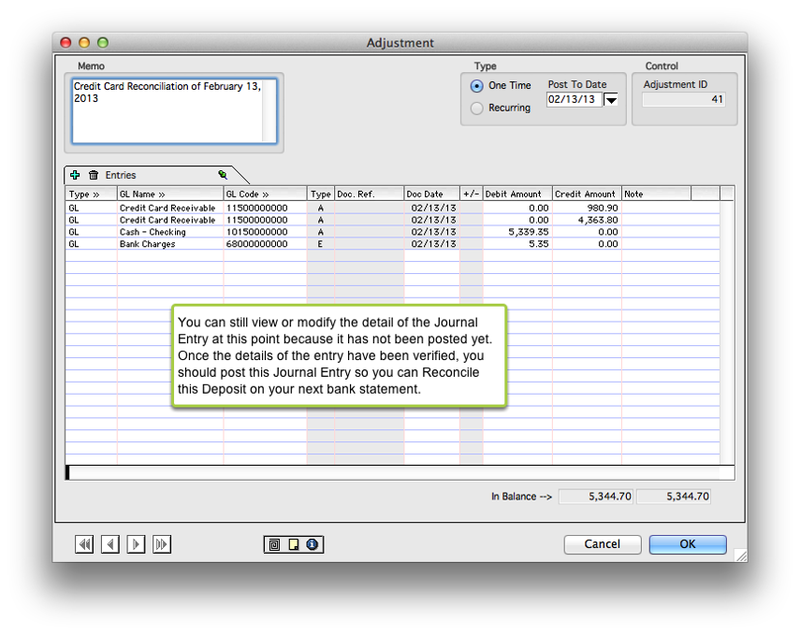 You can clear selected transactions using the same two methods. 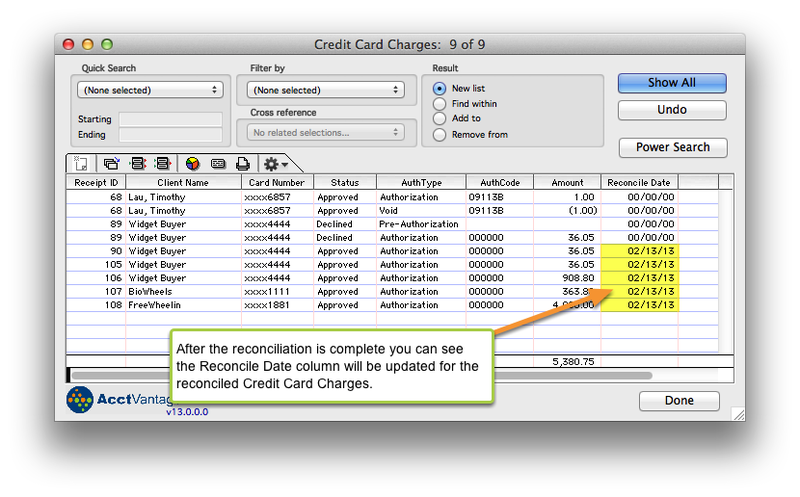 When the transactions to reconcile have a check in their respective far right columns, click the OK button to proceed. If you have not entered an amount for Bank Charges, you will be prompted to confirm: "You have not entered bank charges. Is this correct?" If everything is ready to complete, you will be prompted: "Create an adjusting entry for the selected items?" - You must allow this to finish the reconciliation. 4. The Credit Card Reconciliation is now complete. 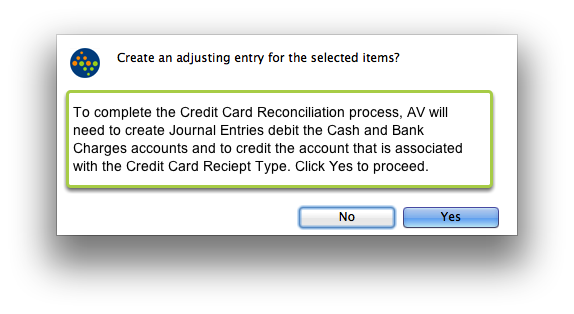 As stated in Step #3, the final step of the Credit Card Reconciliation process is for AV to create a Journal Entry. This entry has not yet been posted. 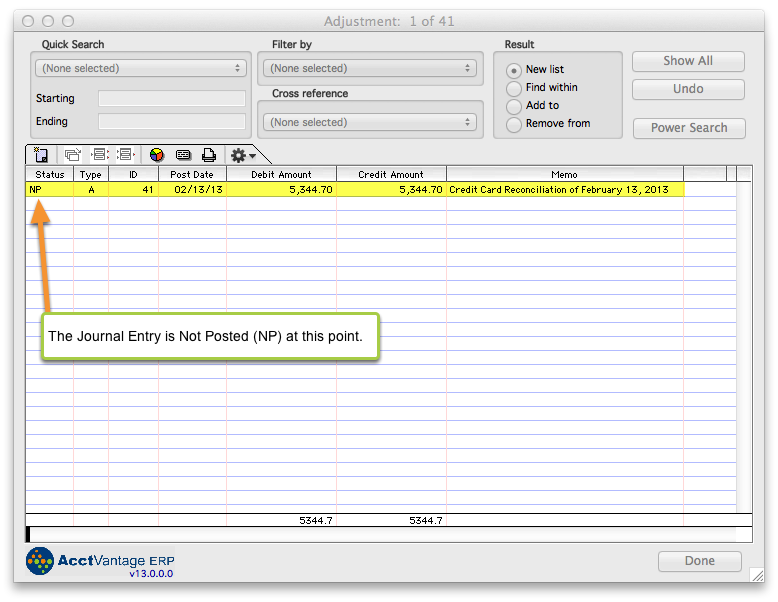 You can post it now, or open the Journal Entry to view or modify its details.